Yes, you’re right. This is not a Turkish recipe but with these ingredients, it could easily be which is why I leapt at it. Turks of course are familiar with the pizza concept thanks to chains like Pizza Hut and Domino’s. Yes, we even have them here. But not in this village where I am, that’s for sure! With the family coming and going, I thought having something like this all ready to go would be the answer. The actual recipe from Woman&Home magazine calls for something far beyond my ken: ciabatta bread mix. Here, what we do is go along to the local fırın or bakery and ask for an ekmek hamuru or bread dough. They are always happy to sell it to you and it makes the perfect pizza base. You just have to make sure you use it the same day, preferably as soon as you get home as it gets stickier by the minute. I have friends in Istanbul who do this when they have friends coming round for tea: this would be the tuzlu component of the tea. 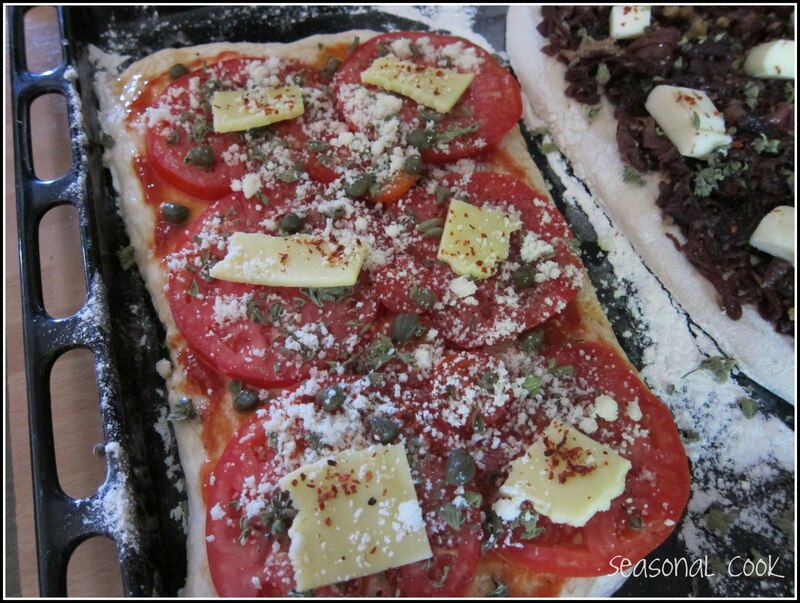 The particular combination described here is very popular with cookery magazines and the like right now – well, I like it too, I must admit.It’s a modern take on traditional pizza. 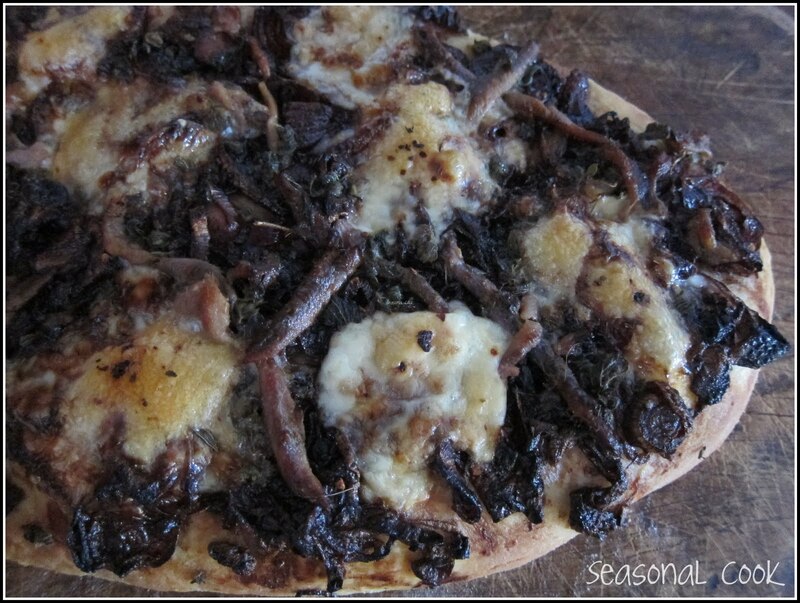 I love that red onion marmelade and the melted mozzarella or dil peyniri on top with the distinctive salty tang of the anchovies and black olives. 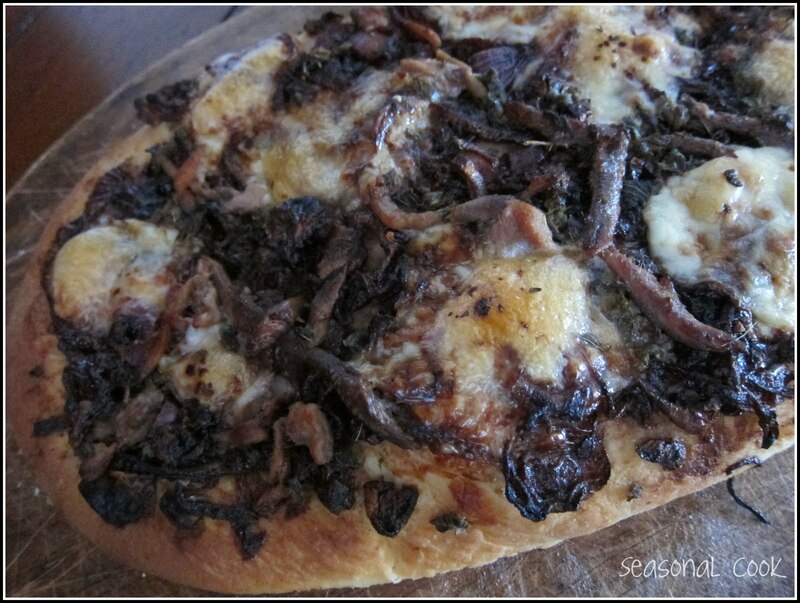 I know that anchovies are not everybody’s favourite so if that is the case, simply omit. Red onions have a delicious flavour especially after being cooked long and slowly, their taste being so different from regular onions: sweet and sticky, not sharp or bitter at all. They contrast well with the anchovies and the black olives that also have their own unique taste. Pre-heat the oven to 220°C/425°F. Check your anchovies. If they are heavily salted, drain, wash and soak in milk till required. Sprinkle flour on a work surface and lightly flour your rolling pin. 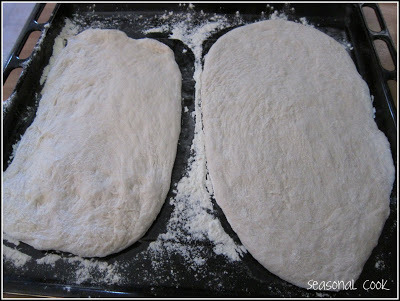 Gently roll out the bread dough to a general shape to go on your baking tray. Line the tray with greaseproof paper and sprinkle with flour. 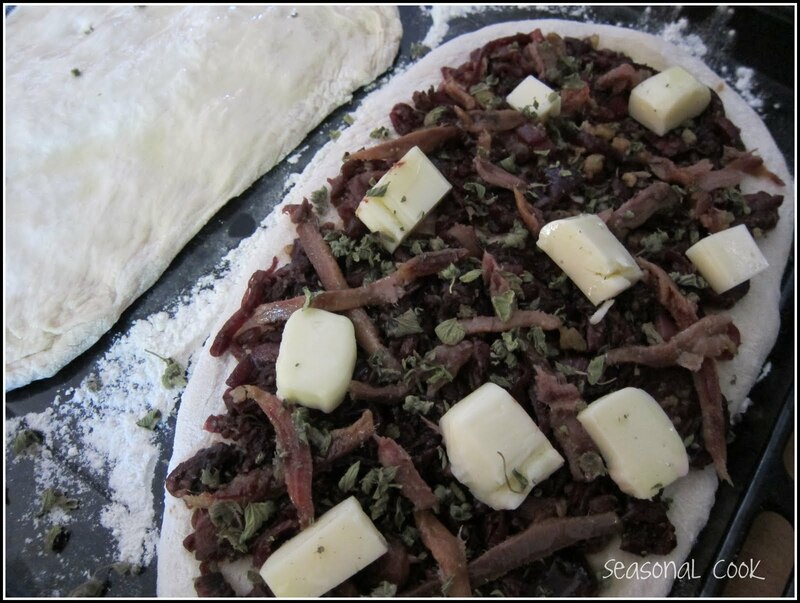 Lay the dough on top and spread with your fingers towards the corners without tearing. You can divide the dough into 2 if you prefer and make 2 pizzas. Meanwhile heat a sauté pan and melt the butter then add the onions, and cook very gently for 30 minutes, until softened and caramelised. Do not rush this. Turn up the heat and add the red wine, vinegar and sugar with a generous amount of seasoning, and bubble briskly until the liquid has reduced to a sticky syrup and the onions are very deep red. Check the seasoning and set aside. Spread the onions over the surface of the dough, then arrange the anchovy fillets in diamond patterns over the onions, then arrange the anchovy fillets in diamond patterns over the onions, add the mozzarella or dil and scatter over the olives and thyme. Drizzle with olive oil and cook in the oven for 10-12 mins. If you are using Turkish bread dough, it takes longer. Mine took about 25 mins. Serve immediately. Oh man I love caramelized onions and anchovies and olives and the whole combination is making my mouth water. Yum! What a great combination. Love your blog! oh yum! i am about to make pizza in the next couple of days. this sure looks good! Looks great! 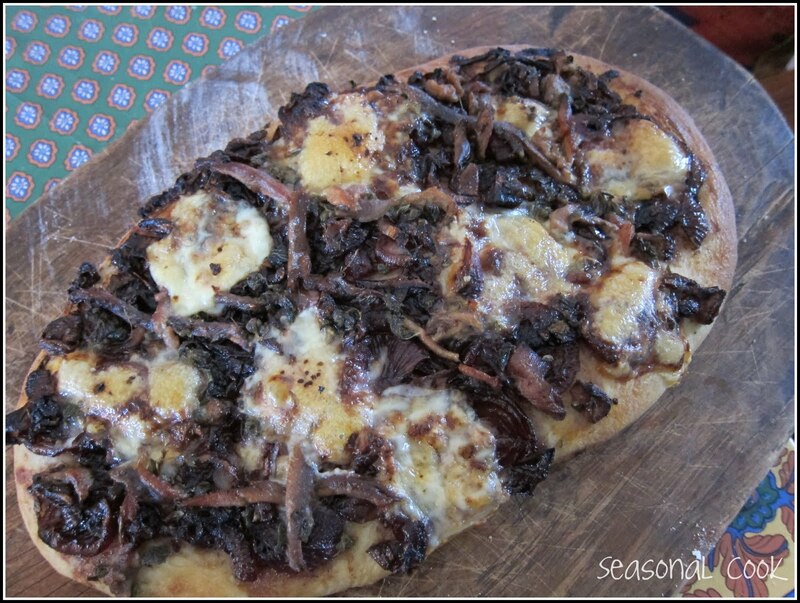 I love caramelized onions and anchovies…what a great flavor combo! oh I am so glad you all like anchovies – but they can be too salty so the soaking in milk is a good idea. I have just caramelised some more red onions and the smell is wafting through the house … this time with homemade tomato sauce. This time we have the basil from the neighbour :)).